From my buddy Brent's site: The cemetery crew is currently working day and night (as well as our permanent residents are clawing out of their tombs) to bring you yet another fun filled haunted cemetery for the 2008 season. 2008 will be our 18th year of bringing sheer terror to the streets of Mountain View. To celebrate we have once again constructed a new series of fully animated props, scares, and effects, to raise the bar for what hopes to be our best year ever and keep up our status of the "Americas Scariest Home Haunt". Click here for videos of the DC Cemetery on HGTV, NBC's Today Show, and Fearnet.com. DC is also shooting to open a week earlier and have two (2) child friendly days where younger tikes can experience the haunt with some of the more scary effects turned off, and the lights on (also open during the day). Click on the dates and times for more information on these days. Take a stroll thru the site, and see you all at the 2008 DC Cemetery (click here for dates and times). If you've seen the show and would like to comment on what you thought of it, please take a moment to sign our guest book. Brent is a good friend and I highly recommend visiting his place if you're in the Bay Area. 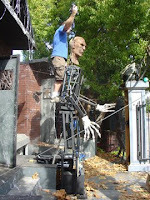 His props are Disney quality animatronics and he is a genius!